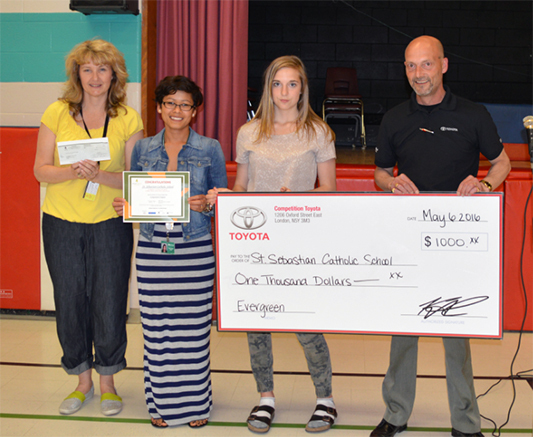 On behalf of the Toyota Evergreen Learning Grounds Program, Dale Craig from Competition Toyota had the privilege of donating a $1,000 cheque to St. Sebastian Catholic School in London on Friday. St. Sebastian Catholic School will be using the $1,000 grant money to plant trees throughout their play area. Public schools and daycare facilities in Canada can apply to receive up to $3,500 in grants to improve their outdoor yard.